A Family in Spain Displayed Three Generations of the "Habsburg Jaw"
The Habsburgs were a dynasty that brought suffering, and eventual ruin, on themselves through inbreeding. Their most famous feature was the "Habsburg Jaw." In the 1980s, a family in Spain with similar facial features gave scientists a better look at a very old genetics puzzle. In the 1660s, the Habsburg family was immensely powerful. They had slowly but surely consolidated parts of what are now Germany, The Netherlands, Belgium, and Spain into an empire to be reckoned with. By 1700, it would all end. Part of this was due to the natural ebb and flow of power over time, and part of it stemmed from the very marriages that had led to the Habsburg's empire. Inbreeding was common among all royalty, but the Habsburgs had the worst possible luck with it. A few unfortunate family traits were bottled up and intensified. As generations of family members intermarried, the Habsburgs became prone to epilepsy, gout, dropsy, and depression. The most prominent sign of their familial connection was the Habsburg jaw, a lower jaw that jutted out from the face. 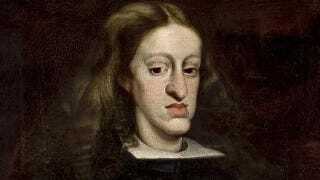 The last of the royal Habsburgs, Charles II, had a jaw so large that he couldn't chew, and had a tough time speaking. His death, without an heir, plunged the empire into war. The Habsburg jaw is not the only distinctive characteristic of the royal line. The Habsburgs also tended to have unusually-shaped heads, a slight cast to their lower eyelids, flattened facial features, and a distinctive shape to their nose. Although scientists believe that these traits may have been exacerbated through inbreeding, it looks like the traits are autosomal dominant. If one parent displays Habsburg facial characteristics, their children have a fifty-fifty chance of displaying the same characteristics. The genes are dominant, and if a person inherits them, they are affected. Evidence for this came in 1988, when doctors treated a family in which three generations displayed Habsburg facial characteristics. A grandmother, her son, and his two sons had the slightly turned-down nose, the slightly flattened facial features, and the prominent jaw of the Habsburgs. Although all of the modern family had the facial characteristics of the royals, they each had them to different degrees. Some had very noticeably large jaws, while others just looked a bit pugnacious in pictures. One boy's nose looked as though it had been broken, while his father's merely looked distinctive. The modern family members were otherwise healthy enough, and of normal intelligence. Their only real problem was that the two sons were being teased in school. Eventually, doctors and the family decided that minor plastic surgery might help the sons get along better, but no other medical treatment was necessary. So while it looks like the Habsburgs may have suffered, their most prominent feature is not primarily the result of too much inbreeding. Nor is the Habsburg jaw really a sign of bad health.